Hathor is the daughter of Re. As the wife of Horus, she is also symbolically the consort of pharaoh. In her cow form she is an aspect of the universal mother. She was assimilated by the Greeks to Aphrodite, the goddess of love. 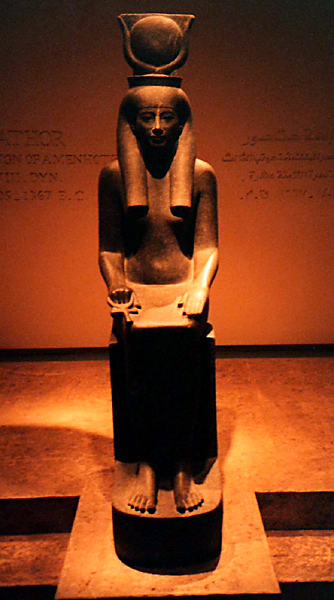 In this statue the seated goddess wears a crown with cow horns and solar disk, and holds an ankh in her right hand. The yellowish cast of these photographs is due to lighting conditions inside the museum.